Capcom Belt Action Collection (Capcom Beat ‘Em Up Bundle) consists of 7 titles that exemplify Capcom’s beat ’em ups of the 1990s. “Powered Gear” (“Armored Warriors”) and “Battle Circuit” are ported from their arcade versions for the very first time, and “Battle Circuit” and “Captain Commando” allow for 4-player simultaneous play. All titles offer online play, allow players to join in partway through a game, or even just spectate. Rensuke Oshikiri is a manga author that loves arcades, and debuted with “Masashi! Ushiro da!”. His masterpiece “High Score Girl” was made into an anime in 2018, and has gained quite a bit of popularity. 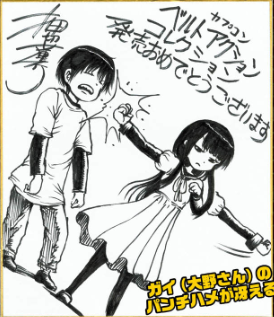 The series consists of “High Score Girl Continue” (volumes 1-5) and “High Score Girl” (volumes 6-9). The 10th volume is planned for release on 03/25/2019. While the downloadable version is already available, the packaged version of the Capcom Belt Action Collection will soon be released. We’ve interviewed manga author Rensuke Oshikiri about the charms of beat ’em ups, in order to convey the charms that this collection has to offer. You’re the author of the manga High Score Girl, Mr. Oshikiri, but you have some very interesting feelings about arcades, don’t you? (Oshikiri) I played beat ’em ups just about as much as I played fighting games. I especially played Final Fight, which appears in High Score Girl, a really ridiculous amount. I also played King of Dragons, Captain Commando, and Tenchi wo Kurau II (Warriors of Fate II) just about as much. I didn’t play too many others on the collection apart from these though. Just as I thought, you remember Final Fight as being the best of the bunch? (Oshikiri) That’s right. Final Fight was popular just before Street Fighter II got really trendy. At the time I was in 4th or 5th grade, and my parents told me that I couldn’t go to arcades. But it was a time where candy stores and department stores had arcade cabinets, so I played Final Fight there because I had no other choice. Eating candy as you played arcade games was the way things were done back then, after all. It’s rough getting good enough at a difficult game to be able to play it for a longer period of time. (Oshikiri) Back then I felt that figuring out how to keep playing Final Fight on as little of my allowance as possible was my purpose in life. One year I got a 1000 yen bill from my mom, and she told me to buy whatever present I wanted with it. I took that money and headed over to a plastic model kit shop in Mizunokuchi, but for some reason they had a Final Fight cabinet there. (Oshikiri) As you might have guessed, I used almost all of that money to play Final Fight. I bet that made your mom angry! (Oshikiri) Of course it did. I think that as a mother, she wanted to see me spend it in a better way. But given that it was 50 yen per play at that time, having 1000 yen with me to play a lot of games was a really fun experience. With continues, it took me exactly 600 yen to reach the end. Then I spent the remaining 400 yen on candy, so I felt really satisfied. I remember that time very clearly even now, so I think it was the right thing to do. My mom was the one who was wrong! (Laughs) Taking the conversation back to Final Fight, did you play co-cooperatively with anyone back then? (Oshikiri) No, I always played alone. I had arcade friends, but when it came to playing together it was a question of which person was going to hold the other back. So I mostly played alone in order to be able to challenge the game with just my own skills. I left the dream of clearing the game with two players to Haruo and Ono in High Score Girl. Did you spend your youth being obsessed with beat ’em ups? (Oshikiri) The charm of most beat ’em ups is being able to play them for a long time on a single coin, if you’re skilled enough. The player characters themselves don’t get stronger, but it feels like you do as the player. Then the bosses are another charming aspect. The graphics on boss characters are more detailed than on the rest of the regular enemies, so they each leave an impression while also striking terror into the hearts of players. The sense of accomplishment from beating a boss is really amazing. I know what you mean! Those kinds of experiences are what makes you the person you are today, right? (Oshikiri) Right. 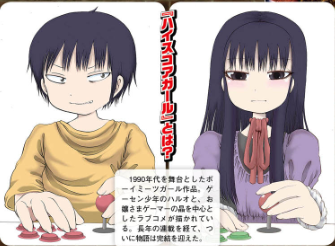 High Score Girl exists because of my experiences at arcades. The thought that people who read it may feel some of their own nostalgia makes me very happy. Still being able to have fun playing these old games now is really great, isn’t it? (Oshikiri) I’ve actually been playing it with my editor recently. I don’t often show people the side of me that basks in the cursing that goes back and forth when playing a game like this with someone else. Those kind of moments really remind me of how I used to be (Laughs). Whenever an older game gets re-issued, a scene of a father playing together with his child takes place somewhere. Now I’ve really come to think that the Street Fighter 30th Anniversary Collection and the Capcom Belt Action Collection being re-issued at the same time that High Score Girl was made into an anime is just incredibly good timing. I want to have some fun playing the Capcom Belt Action Collection online myself, so I look forward to being matched up with some of you out there for multi-player. A spin-off of my manga High Score Girl is also being included as an extra in the eCapcom store limited edition version of the collection. It’s about Captain Commando, so I’d really like for everyone to check it out.